1. I have never had a cell phone and I don’t want one. 2. I have a love/hate relationship with my town. 3. I have a recurring dream about missing the school bus. 4. My first car was a 1987 diesel Mercedes. 5. The first story I ever wrote was about a Border collie named Mimi. 6. I love Bright Leaf hot dogs. 7. I hate wearing makeup. Thanks for the award! I’m honored that you should think of me! Lovely random facts, by the way! Thorough deserved Maggie! And thank you for passing on the honour… Sweet! You are irresistibly sweet, Maggie! Loved the factoids . . . especially “no cell phone.” You rock. Are Bright Leaf hotdogs a brand (like Oscar Meyer) or a type (like pork vs. beef vs. leaf)? Thanks for the mention, link, and award. Aw, thank you! Bright Leaf hot dogs are a brand, mainly found in North Carolina. Thanks for the love Maggie. I have to get on here more and get my blog around. I’m absolutely thrilled to have got this award from you, Maggie! Thank you so much! Wow. What an honor. Thanks very much. I’ll have to figure out who I should give the award to. If you hadn’t already got one, you’d have been on the list, that’s for sure. No problem! You deserve it. 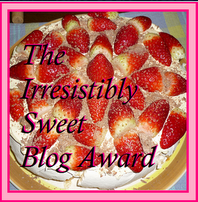 Congrats to all of the award winners.. some are my friends already, as I see their blogs. Thank you so much, Maggie! And congrats, yourself. I had to get a cell phone, but I refuse to get a Facebook page! My recurring dream involves being late for work. Seriously, I’m on FB, but I don’t spend much time there, and I’m not on Twitter. My idea that FB is not essential is supported by Tavi Gevinson (www.thestylerookie.com) who gets more hits than most of us can imagine and who lectures fashion industry professionals on how to reach the young market. Her blog proudly declares that she’s not on Facebook. I think I need to look at her blog. Thanks so much for including me, Maggie! I was # 15 but was never told i was nominated so i couldn’t give you my 7 random facts. At least i was nominated.. Thanks. id like to stay in touch with you. Maybe someone else nominated you… because you’re not on my list. Gracie, you got the award from me, not from Maggie. I linked back to her because she gave the award to me originally (it’s like a “pay it forward” kind of thing). I couldn’t figure out how to log onto your blog to comment, that’s why I posted it on Facebook.